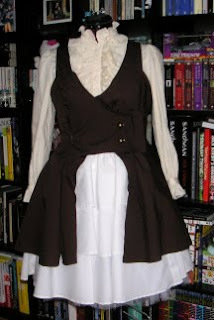 I've started work on the waistcoat style overdress that goes with the tiered skirt I made. It looks a bit iffy at the moment but its not sewn together or anything. I'm having a go at draping on the dress form rather than drawing a flat pattern. I've not tried making something this way before and I'm not sure the shape is quite there yet; the gap at the front of the skirt looks a bit funny. The other problem is the length. I thought it would be good if the waistcoat was shorter than the skirt but I think I'll add a ruffle to the bottom make them a bit more even. I'd like to find some better fabric but I am going to use these buttons - they are the same as the ones on this waistcoat. I'm starting to think about making a blouse to match too, maybe with a big neck bow. Crêpes are much lighter than pancakes and very tasty. These recipes are really easy and don't need any special ingredients. I am so impressed with how well this sauce works, there must be some kind of magic involved. I've put the american measurements on here as they are easier for this kind of simple baking and you can double them up quickly for more people. No pictures again I'm afraid - they just don't stay around long enough! Mix egg, milk, water and butter in a bowl add salt and flour last. Beat till it's smooth. When you are ready put a frying pan on a medium heat and add a little butter or spray oil. Put 1/4 cup of the batter in the middle of the pan and swirl it around. After about a minute the edges will start to lift slightly and look a bit crispy - slide a fish slice or something similar underneath and flip it over to cook on the other side until it's slightly brown. Serve folded over with chocolate sauce in middle. yum. Mix the sugar, flour, salt and water together in a small pan with a whisk then add the cocoa and stir over a medium heat until it starts to boil. It suddenly goes really thick and gorgeous! Take it off the heat and stir in the butter and possibly a drop or two of vanilla or coffee. Try not to eat too much of it before the crêpes are ready!